-Our natural pattern leather is softer feeling but much endurable,water proof in the light rain,no strange smell at all. -"Sharp your spirit for NEXT exciting moment!" Based on prime users feedbacks,previous batch running large,THANKS!We hv upgraded it from the new ones. We're eager to hear your voice more than ever, encouraging us improve our jackets even greater! XS: Chest/41.0" Shoulder/17.3" Sleeve/24.0" Length/26.0"
S: Chest/42.5" Shoulder/17.7" Sleeve/24.4" Length/26.4"
M: Chest/44.0" Shoulder/18.1" Sleeve/24.8" Length/26.8"
L: Chest/46.0" Shoulder/18.5" Sleeve/25.2" Length/27.2"
XL: Chest/47.5" Shoulder/18.9" Sleeve/25.6" Length/27.5"
XXL: Chest/48.3" Shoulder/19.3" Sleeve/26.0" Length/28.2"
XXXL: Chest/49.2" Shoulder/19.7" Sleeve/26.4" Length/29.0"
Wash Introduction: Hand wash.Don't wipe with gasoline.Prevent from dry-clean or machine-wash.
Due to monitor settings, maybe a bit color difference, pls be understanding.Feel free contact us for any problems,we're ready to help always. 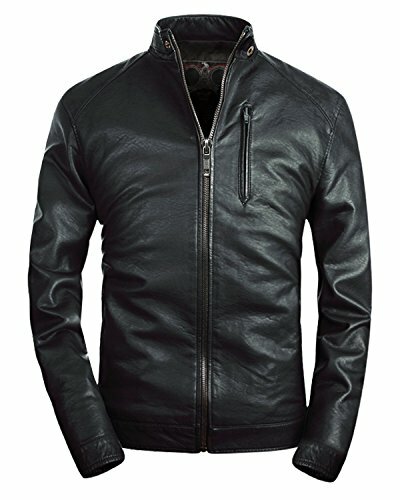 Splendid handmade motocycle jacket for men, BUILT TO LAST! If you have any questions about this product by Fairylinks, contact us by completing and submitting the form below. If you are looking for a specif part number, please include it with your message.